The Don Diego apartments are as typical as you'll get in Playa del Ingles-standard one bedroom,bathroom,small kitchenette and living room and balcony. We've been to PDI 15 times now so generally know what to expect in accomodation standards. 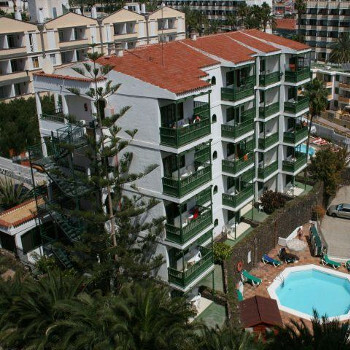 The apartments have a great location close to the beach (10 minutes downhill-20 back up 60 steps!) 5 mins to Yumbo centre-5 mins to nearest supermarket. Previous reviewer noted the lack of staff-same with us-reception is a cubby hole,the only staff we saw the whole time were two very pleasant and extremely hard working maids-but who spoke no english. Pool is smaller than average-but pool area relatively empty the time we were there-and that was Gay Pride week-so the resort was busy.No where near luxury accomodation but clean, adequate,and a good base for a no frills clubbing holiday which is what we were after anyway. Wouldnt hesitate returning. The apartments were brilliant for what we paid for them. They are pretty basic, a bedroom with 2 single beds, a bathroom, balcony and a kitchenette/ living room with a tv. The tv asks for money but we were able to watch for free. There is also a pool, however it is quite small, we didn't spend anytime there, just walked to the beach everyday. The apartments were kept very clean, and the linen was changed regularly. The only problem was there were only 2 maids who didn't speak a word of english and they were the only staff we saw the entire time. When you first arrive at the hotel to check in, if you arrive after 19.00, the maids have gone and the gate is locked, the only way to get in then is to ring a number on the gate for Securitas to let you in so you will need your mobile to work in Spain, or some change for a payphone. The location of the apartments is excellent, 2 minutes away from a supermarket, 5 minutes away from the beach, 5 minutes from Yumbo in 1 direction, 5 minutes from Kasbah and 10 minutes from Irish centre in the other direction however the apartment block is set on hill so you have to be fit! Also the block doesn't have a lift, so if yu are like us, u will have to drag your case up 5 flights of stairs!